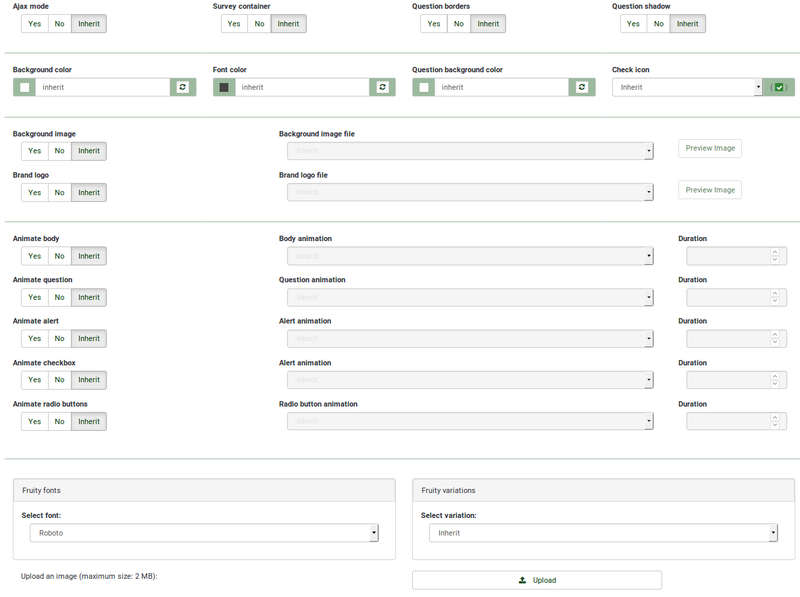 LimeSurvey 3 introduces a complete new template engine system, based on Twig 1.29 and Bootstrap, and allowing template inheritance and template options. Install Limesurvey 3.0+ to get access to the survey theme options feature. This option will not be made available in the older LimeSurvey versions! LimeSurvey 3 contains a new feature called theme options that offers a set of various tools that allow the survey administrators to quickly and easily change the themes-related settings of their surveys. The toolbar of the panel contains two tabs: the simple and advanced options of the theme editor. Please note that each theme comes with certain options that can be changed from the survey theme options. 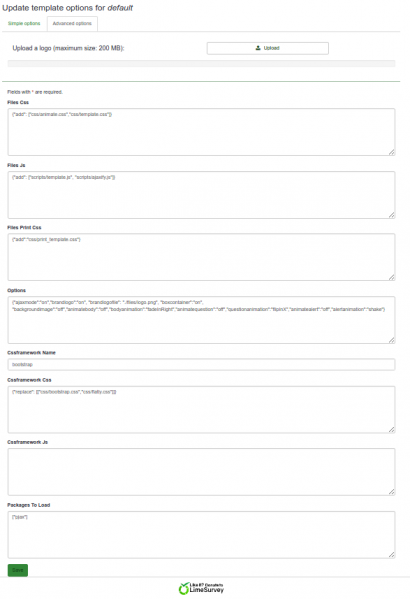 In this wiki section, the default LimeSurvey theme fruity is used to show everyone the easiness through which quick and easy, yet powerful changes can be implemented to a theme by users without any prior knowledge in HTML, php, and/or CSS. or enable another configuration - yes. The theme settings can be configured as you wish if this option is chosen. You can observe that each theme setting allows you to select the inherit value. at the survey level. The survey theme settings inherit the survey group theme settings. Theme variations: Select one of the available theme variations from the dropdown list. It changes the font and the icons colour. To show the power of this feature, the below explanations will be based on the fruity theme. Please note that each theme comes with its own customizable options. Survey container: If yes is selected, the survey will be displayed in a container - its width is limited. This option is useful if your survey participants complete your survey from their mobile phones or tablets because the survey width is controlled. Therefore, it is more comfortable for your respondents because they will not have to scroll right anymore to read the whole question or to see all the answer options. If the survey is embedded in a blog and/or forum, you can also deactivate this option since they already use a certain width. Question shadow: If enabled, a shadow will be displayed around the in(visible) question borders. Font color: Change the font color by selecting from the popup menu the desired color. Question background color: Change the question background color by selecting from the popup menu the desired color. Check icon: This setting allows you to select the desired check icon when multiple choice question types are employed. Brand logo: If set to no, the name of the survey will be shown in the top bar, else, you can select one of the pictures inside the file directory to be used as logo picture. Animate question: If set to yes, you choose one of the animations to apply to your survey questions when they are loaded. Animate alert: If set to yes, your survey alerts (when the survey data is not recorded or the wrong token is typed in) will be animated according to the selected animation option. Animate checkbox: If set to yes, anytime you check an answer option, the animation is triggered. Animate radio buttons: If set to yes, anytime you select an option from a radio-type question, the animation is triggered. The library used for animations is animate.css. You can either use the default one or add your own animation library. Type in a number in the duration field. If you type ten (10), then the animation will last for 10 seconds. Fruity variations:Select one of the available theme variations from the dropdown list. It changes the font and the icons colour. Upload: Browse your computer to upload an image to be used as logo or background image for your theme. Writing permissions might be requested on the "/themes/survey/fruity/files" folder - the location where the uploaded images will be stored in your LimeSurvey installation. When you open the theme options tab, you can choose to edit either its simple options or its advanced options. “Advanced options” is just a naked form that gives you access to the main theme configuration fields from the database. To understand how it works, you should also read about the XML file and the creation of a theme from scratch. So, it’s rather complex and made for advanced users. Packages To Load: You can load from this setting some core asset packages from LimeSurvey. You’ll notice an upload input at the top, which gives you the possibility to upload a file into the file directory of the theme. These parameters can be used to change the entire appearance of the theme. Warning! : Don't touch the values unless you know what you're doing! This page was last edited on 18 October 2018, at 12:03.